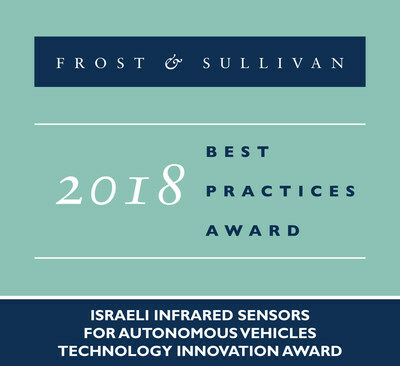 LONDON, Dec. 3, 2018 /PRNewswire/ -- Based on its recent analysis of the Israeli infrared (IR) sensors market for autonomous vehicles, Frost & Sullivan recognises AdaSky® with the 2018 Israeli Technology Innovation Award for its high-resolution, solid-state passive far IR (FIR) thermal imaging technology. The solution offers superior detection and identification of any issue that compromises image quality and helps overcome the hindrance to present a clear, precise image. This capability will be extremely valuable in autonomous driving by supporting operation in any weather or lighting condition. "Typical FIR sensors or cameras for auto night-vision rely on a shutter, which could require the sensor to be shut down to perform recalibration. In partnership with STMicroelectronics, AdaSky developed an image signal processor (ISP) chip that eliminates the need for a shutter so that the sensor can work 24/7," said Principal Analyst, Peter Adrian. "AdaSky's sensor, Viper, uses high-end, proprietary deep learning algorithms based on convolutional neural networks to ensure more accurate object detection, classification, and scene analysis, which ultimately offers the driver an early warning of a pending issue or challenge." The thermal sensors can capture objects that otherwise elude visible light cameras, radar, or Lidar by detecting the IR thermal radiation emitted by an object and converting the information into a thermal image. Leveraging image processing algorithms and computer vision, the sensors operate seamlessly in changing lighting conditions, clutter, or bad weather, and can detect, segment and analyze an object, be it a car, pedestrian, bicycle or motorcycle. Viper operates in the FIR range (8-14 micrometers), which is very effective in hot weather. AdaSky successfully tailors mature FIR sensing technology to meet the situational awareness demands of autonomous vehicles. The FIR thermal imaging cameras with different fields of view support detection in multiple directions among connected cars to provide a more comprehensive picture of the vehicle's environment. As passive FIR sensors do not require huge amounts of energy to illuminate a target object and are not susceptible to interference from neighboring sensor signals, they can work to detect and cover a vehicle's surroundings without ever upsetting the sensors of other vehicles. Viper is unique in that it does not require a shutter (which other FIR cameras typically do), because it uses the startup's shutterless, non-uniformity correction, and due to the dedicated ISP chip. Viper is the smallest FIR sensor on the market which makes it highly cost-effective. In fact, Viper costs less than traditional IR night-vision sensors and are unaffected by oncoming headlights, direct sunlight, or changes in lighting. "AdaSky excels at coordinating and scaling its production capabilities to meet rising production requirements. The company is now focusing on collaborative development, prototyping, and proof-of-concept with OEMs," noted Adrian. "It excels further at being able to configure its FIR sensing technology to optimally support different types or categories of autonomous vehicles. Overall, its technology, which helps generate reliable images of the surroundings to enable fully autonomous vehicles, has positioned AdaSky for exponential growth in the future." AdaSky leads the FIR revolution by bringing a high-resolution thermal sensor to the automotive market, enabling autonomous vehicles to see better and understand more. AdaSky's founding team is made up of veterans from the semiconductor, thermal sensor, image-processing, and computer vision markets. They have been developing state-of-the-art FIR sensing solutions for the last decade. Now, the company's multidisciplinary team of experienced engineers has adapted the solution to the specific needs of self-driving cars, making AdaSky's solution a critical addition to cars to eliminate vision and perception weaknesses for fully-autonomous vehicles. Learn more at http://www.adasky.com.